Contrary to popular belief, Kahlil Gibran, Lebanese artist, poet and philosopher, best known the world over as author of The Prophet, did not lead a properly ascetic life. He had a sober life-style, to be sure, and used to spend most of his time writing, painting and drawing by himself in his studio. He eats very little. […] An orange for breakfast – and a cup of Turkish coffee – or only the coffee. No lunch or a bit of bread and a cup of coffee – or just coffee – or a piece of fruit. A dinner that would be small for anyone else. And no more. Nothing between meals. Am I too thin? I feel well, I usually eat one meal a day – my imagination and food don’t go together. I’m always keener mentally and imaginatively before a meal than after. One day a month, or two days together in a month, I go entirely without food – regularly. If anything is wrong with me, I just starve a while – and I get well. I have a young friend who was ill. He went to a fast cure, and was twenty-one days without eating. The theory is, that the poor and infected tissue is the weakest in the body and that when the body has no other food, some of the body itself is consumed, or fails to be sustained, or perishes – and the weakest part goes first. With you [Mary] I always eat well. I feel at ease – and I’m hungry and I’m not going to work after dinner. When you are not here I dine out oftener than alone. Life is not cruel. It is great. And we kill nothing. You only change its place, you transfer it from one vessel to another. When you use sugar, you put it from a bowl on the table into your own veins. The Hindus lay such stress on physical death that they eat no flesh, but only herbs – as if the herbs have no life and are not killed in order to be eaten! He often repeated that, for him, it was sufficient that food was “delicious and clean,” but this does not mean that he was not a lover of good cuisine – Italian cuisine, for example. Kahlil and Mary in New York, when not at Childs’ (one of the first national dining chains in the United States), used instead to eat at Gonfarone’s (their favorite), Delmonico’s, or Moretti’s. He would say, “In the East there is a custom of eating all from one huge vessel. Let us have our soup tonight in one bowl!” So we would arrange the small table with one large bowl of soup. There were always croutons, many croutons, and the soup was thick, a puree. […] Next a glass of wine and breadsticks to be dipped in the wine – another of his favorite pleasures. 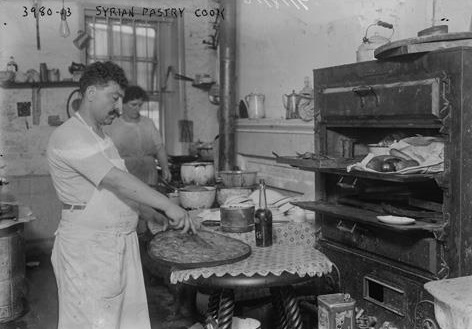 While Gibran enjoyed an occasional steak, he preferred dishes prepared as in the land of his birth, Lebanon, and he frequently patronized a coffee house and restaurant located at 19 Washington Street. 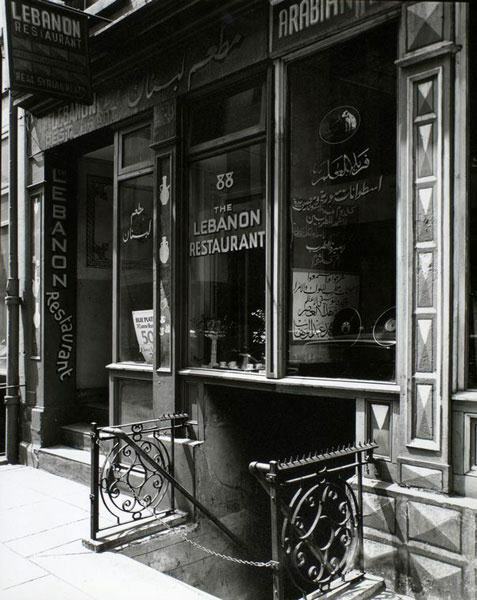 This restaurant was operated by an émigré from Zahleh, Lebanon, named Milhem – a man of portly stature, and well versed in Arabian cookery. Among the dishes Gibran enjoyed most was Lahm Mishwi, which is known today as Shish Kebab. This dish, as prepared by Lebanese people, consists of lamb meat cut up into one-inch cubes, then strung on a skewer, alternated with chunks of tomatoes, green pepper, and onion slices, then broiled and garnished with chopped green parsley and onions. There was a side dish of Laban yogurt, and a demitasse cup of strong Turkish coffee to finish the meal. 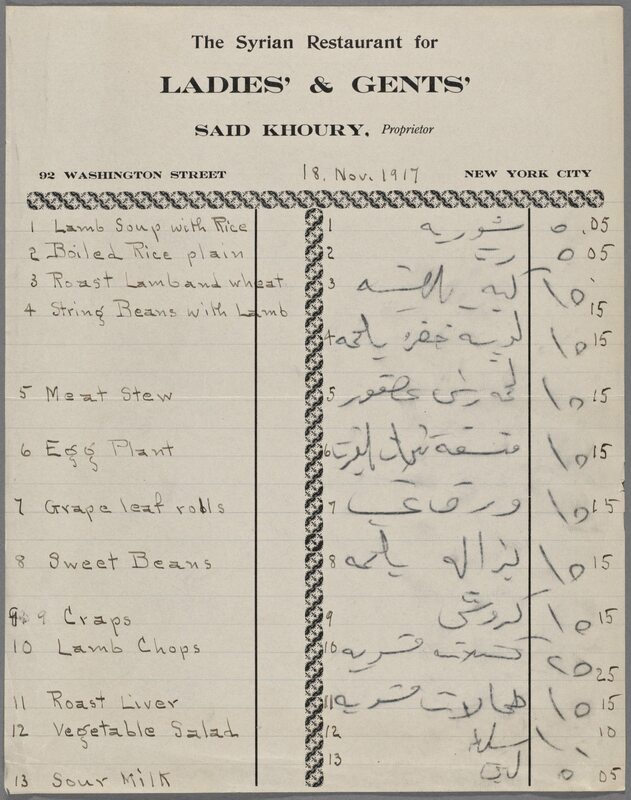 Another dish Gibran favored was Kibbi the so-called national dish of the Arabic-speaking peoples. Kibbi is made of coarse, ground wheat, called “Burgol” in Arabic. The ground wheat is placed in a stone mortar; finely ground lamb or beef is then added and pounded into paste-like consistency, after which it is placed in a flat pan and spread to a thickness of about three-quarters of an inch. On top of this first layer go thinly sliced onions, browned ground meat and Snowbar – pine seed – all saturated with butter and seasoned with salt and pepper. Another layer of the same thickness as the bottom layer is then spread on top and placed in the oven to bake. Still another dish relished by Gibran was Malfoof, a variation of which is being currently served as stuffed cabbage, and stuffed grape-vine leaves. The filling is ground meat mixed with rice, seasoned with salt and pepper, then rolled cigar-like into a wrapper of a leaf, placed into a pot, topped with slices of tomatoes, covered, and placed on the burner to cook. 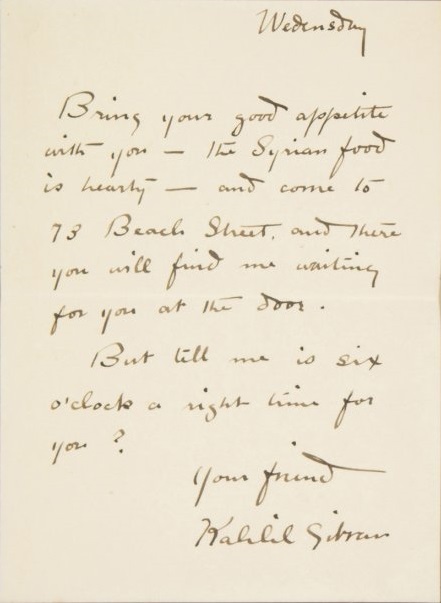 Gibran was not a teetotaler. He enjoyed a bit of Arak, which is an alcoholic drink distilled from grapes, and seasoned with essence of aniseed. However, his indulgence was limited, and at no time did I or any of my associates observe him to be under the influence of liquor. He was fond of Turkish coffee, and drank one cup after another as he smoked the Turkish tobacco cigarettes with cork tips made by Parsons and Ossiani Brothers in a building located at 60 Washington Street. And he said: “Would that you could live on the fragrance of the earth, and like an air, plant be sustained by the light”. When you kill a beast say to him in your heart: ‘By the same power that slays you, I too am slain; and I too shall be consumed. And when you crush an apple with your teeth, say to it in your heart: ‘Your seeds shall live in my body, And the buds of your tomorrow shall blossom in my heart, And your fragrance shall be my breath, And together we shall rejoice through all the seasons. ‘I too am a vineyard, and my fruit shall be gathered for the winepress, and like new wine I shall be kept in eternal vessels’. – Kahlil Gibran, The Prophet (New York: Alfred A. Knopf, 1923). – Barbara Young, This Man from Lebanon: A Study of Kahlil Gibran (New York: Alfred A. Knopf, 1945), 29-30. – Virginia Hilu (ed. ), Beloved Prophet: The Love Letters of Khalil Gibran and Mary Haskell and her Private Journal (London: Quartet Books, 1972), 103, 168, 306, 406, 427. – Joseph Nahas, Seventy-eight and Still Musing: Observations and Reflections: with Personal Reminiscences of Gibran as I Knew Him (New York, Hicksville: Exposition Press, 1974), 48-49. 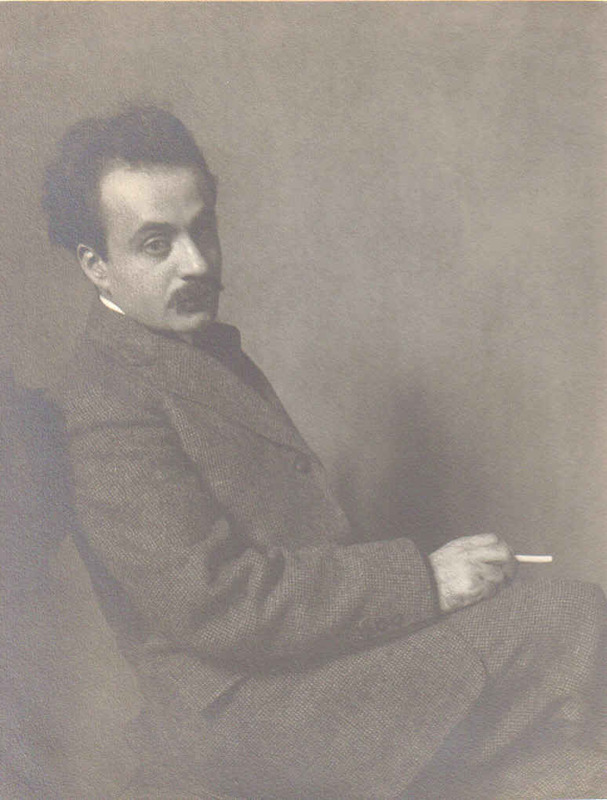 – Mikhail Naimy, Kahlil Gibran: A Biography, (New York, Philosophical Library, 1985), 28. – Robin Waterfield, Prophet: The Life and Times of Kahlil Gibran (Harmondsworth [UK]: Penguin, 1998).